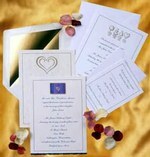 Make your wedding special with our choice of free invitation and programs templates. You can create your own stunning wedding programs and invitations by downloading the template that suits you best and choosing from our range of wedding stationery and accessories. With everything from scrolls to wax seals, tassels to decorative boxes, you can go overboard on style while staying under budget. Paper Alchemy offers templates in all styles from casual to very formal, so we are sure to have something that will suit your needs. Just download our free program and invitation templates, purchase your stationery supplies and follow the simple instructions to create your own exclusive, unique invitations, programs and place cards. 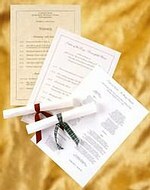 If you are unsure about the wording of your wedding invitation or if the order of your program is troubling you, we can even help with that - just visit our wording hints and tips page. Clicking a link will take you to the download/instructions page for that template.